Check out the restoration pages for a listing of all the work that was done to the car in order to get it back in road-worthy condition. 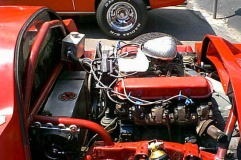 The V8 conversion pages show changing the car from VW powered to a 500 cubic inch Cadillac engine. I recently started working on the car again. I am changing motors, the 500 was just a bit more power than any sane person would need. I will be changing just about everything about the car this time. I am wanting to make a very good car that can be driven daily and still have good performance and comfort. I plan on having very good mileage, comfortable interior with enough creature comforts for a 10 hour drive, and ultimately adding power to it until it has enough performance to satisfy me. Right now I am trying to get the new drivetrain in the car and get the basic work done to the car to make it a capable daily driver. Once that is done I will be adding more to it including a hybrid drive system and a turbo.